I have one bucktail currently and I fished this a good amount this year. It's a 1oz Spro white bucktail that sinks wicked fast -- not much hair on it. Looking to add some more bucktails to my tackle box and found ones that looks nice -- they are called S&S Bucktails John Skinner Striped Bass. I like the look of these because the have more hair and look like they wont sink so fast. I use two rods -- one is around 7' and the other is 8' and they are both Medium or MH rated for ~10-20 lb line. The 1oz Spro bucktail I have casts like a bullet with very low arch from the fast-action rod rip. I cast off the docks in my neighborhood into shallower water at spots (~10-20 feet) and then also into the current of a river (Annisquam River) near the mouth of a large bay (Ipswich Bay). This current in this river when the tide changes can be raging hard. I also cast off the rocks into rocky areas along the coast (Gloucester, Rockport, Marblehead areas). I was thinking of getting 3 bucktails -- 3/4oz (for shallower areas with rocks) and 1.5oz (for casting into raging current) in white. I was also thinking of a black 1oz one for fishing at night. I fish at night mostly. Anyone use chartreause/neon green? 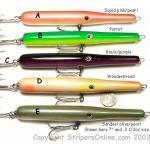 Look at some Andrus bucktails for casting. Bunch of styles and weights. 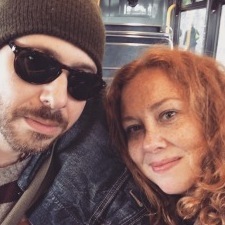 Check out Dan the Tinmans stuff in the BST section also. Spro style isn't always the best for cast and reel action. The skinner S&S ones are good from a boat. And yes you will want to by them in multiples. Interesting. What makes a bucktail better for use from boat vs land? I will look into Andrus and others. Thanks for the recommendations. On the spro BT's the hook eye is further back and the weight of the lure is more towards the front so works better with a vertical jigging action. On the S&S skinner ones he moved the eye more towards the front but still fishes similar to a spro. 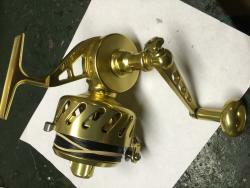 Look at the Andrus jetty caster, ball jig and rip splitters to see the difference. IMO, what you have listed as "to get", sounds about right for weight if the water depth is 10' to 20' as you say. In places I've fished I've used everything from 1/8 oz, up to about 2 oz for casting, and heavier for trolling. Probably used 1/2 oz to 1 oz the most, because of shallower water. The idea of having them dressed both full and sparse is also good. For the same weight, a fuller tied bucktail will sink slower than a sparser tied bucktail. 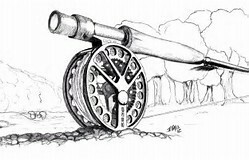 Nothing wrong with that and can be advantageous because sometimes the fish want that slower fall, and it tends to keep the jig in front of them a little longer when they're suspended. Add some different trailers, various plastics and the combinations of bucktail & trailer can allow you to fine tune profiles & fall rates. Pork rind is still a great trailer if you can find it. For colors, everyone has favorites. Those discussions have been done many times. Hard to go wrong with white, black, chartreuse, and yellow is very popular. Wine or Burgundy, is also good colors. But, the fact is it still goes back to everyone has a favorite. I've tried all kinds of colors & combinations over the years, and they'll all catch some fish, sometimes. I like chartreuse for example that is more on the yellow chartreuse, fl. yellow side but still keep some jigs that are on the green chartreuse, or lime green side, because sometimes one produces better than the other when they'll take a "chartreuse" bucktail. Try some different colors and see what works for you, day or night. Many folks like white. Don't forget something to trail it. Usually use the berkley powerbait mullet grub. Backbays, little to no flow.... 3/4 to 1.5oz. Inlets, water moving well.... 1oz to 3oz usually, sometimes you need more. Bought some from dan the tin man recently, they're great. He's has a bullethead style with the hook eye right upfront at a 45degree. I swear dan uses 3 to 4 times as much hair as the leading guys. Mustad makes a bucktail with 2 hook eyes. Don't think more is better. OFten yes, all the time, no. You need the right bucktail for the job. Looks right for what's in the area size wise, but gets down to where the fish are, but not all the way down. Back to color, I like white with a touch of another color all weights. A few yellow ones and a few dark ones. Wine or burple. Dark colors work at the right times at night, not every night. While your bucktailing, get some cheap good sized grubs and jigheads, and a few tsunami shads too. Very similar action and style. Chratruse, some folks believe they're more of a bluefish magnet. Andrus Jetty Casters- white - 1/2oz /1 oz. / 1 1/4oz./ 1 1/2 oz./ 2 oz. and 3oz. Also. 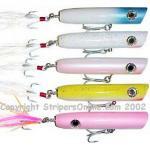 get some white trailers from Fat Cow strips, Otter tails or plastic ( rubber) twister tails. 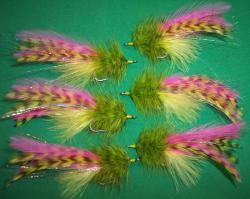 I would also buy a few small "lima bean" head bucktails from Andrus in white in sizes 3/8 oz. and 1/2 oz. to use from an "egg and a jig" rig. See photo. 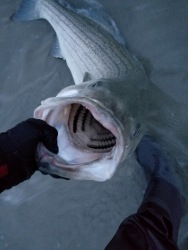 This rig is one of the best lures for daytime stripers. You'll have to find some wooden eggs from a craft store and make them up over the winter. A very easy project. How long is the leader on this rig? 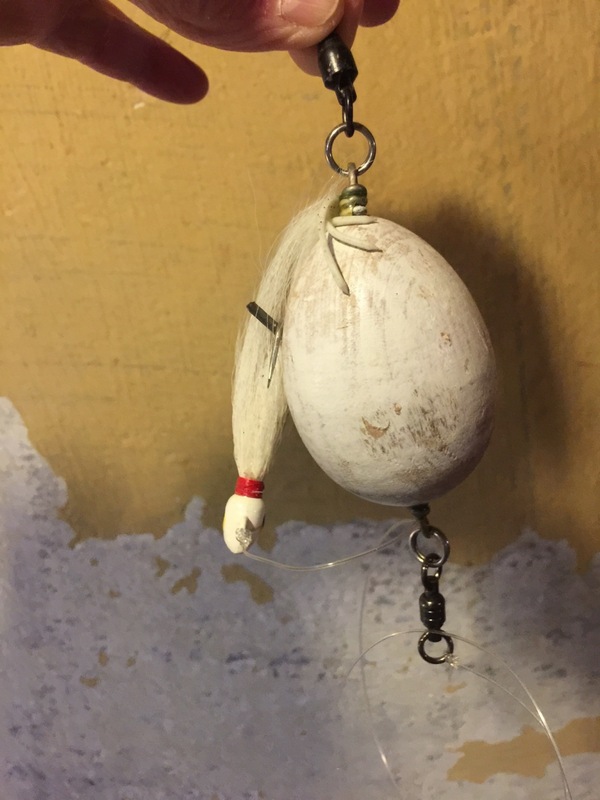 if you are fishing Chatham and Brewster with any regularity i would for the bucktails and go with a small paddle tail such as Al gags whippet or storm search baits either 1/4 oz 3/8 or 1/2.at least from the beach.before these plastics came out i fished bucktails almost exclusively,fishing the inlets on the south shore of LI,i literally have at least a thousand of them from a 1/4 oz up to 6ozs,and they rarely get used on the sand beachs of the cape. Steve do you ever use heavy plastic or composition eggs to get down deep? 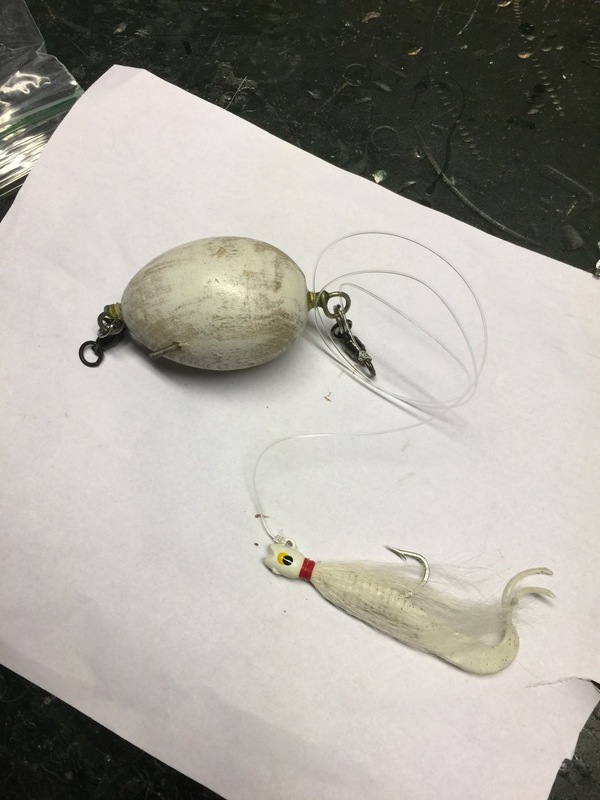 The wooden egg helps the cast but doesn't it keep the jig off the bottom or does the jig take the egg down. Are you eggs made of a hard wood ( Oak ) or are the light weight made of a soft wood ( pine ). if you are fishing Chatham and Brewster with any regularity i would for(go) the bucktails and go with a small paddle tail such as Al gags whippet or storm search baits either 1/4 oz 3/8 or 1/2.at least from the beach.before these plastics came out i fished bucktails almost exclusively,fishing the inlets on the south shore of LI,i literally have at least a thousand of them from a 1/4 oz up to 6ozs,and they rarely get used on the sand beachs of the cape. I bought some Andrus Jetty Caster Bucktails from JH last night -- went with a 3/4oz and a 1.5oz for now (white). If I find the need, I will also fill in the other weights in the Spring.